President Donald Trump speaks about immigration alongside family members affected by crime committed by undocumented immigrants, at the South Court Auditorium in the White House complex, June 22, 2018, in Washington. President Donald Trump, after a tactical retreat this week on immigration policy, demonstrated Friday that there is no strategic shift to his overall tough approach to those attempting to illegally enter the country, and vowing to "end the immigration crisis, once and for all." U.S. immigration laws, Trump declared, are "the weakest in the history of the world." Trump made the remarks in an auditorium in the Eisenhower Executive Office Building, adjacent to the White House, where he presided over an event with so-called "Angel Families," those who have had relatives killed by people who entered the country illegally. "Your loss will not have been in vain," the president told the families, who held large photos of their slain relatives. "We will secure our borders … the word will get out. Got to have a safe country. We're going to have a safe country." Trump called family members to the presidential lectern to recount how their loved ones had been killed by those who were in the United States illegally. Several of those speaking condemned the media for ignoring the stories of the victims and praised Trump and Vice President Mike Pence for their attention to border security. 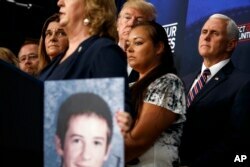 President Donald Trump listens during an event on immigration alongside family members affected by crime committed by undocumented immigrants, at the South Court Auditorium in the White House complex, June 22, 2018, in Washington. Trump, in his remarks, also suggested those illegally in the United States commit more crimes on a statistical basis than citizens or resident aliens. However, studies have shown that undocumented immigrants are less likely to commit a crime in the U.S. than native-born citizens, including one published by the libertarian CATO Institute this year. Following intense domestic and international condemnation, Trump on Wednesday signed an order ending his administration's practice of separation of children from their families while parents were being prosecuted for crossing the border illegally. The administration's recently implemented "zero tolerence" policy led to the criminal prosecutions of undocumented border crossers, which in turn led to federal officials separating adults and their children. The White House on Friday also accused media and opposition Democrats of pushing an agenda by misrepresenting a photograph linked to the policy. He was referring to a Getty Images picture of a Honduran toddler at the border, sobbing as her mother was searched and detained. It was widely published, ending up on newspaper front pages. According to White House spokeswoman Sarah Sanders, the child was not detained separately from her mother. 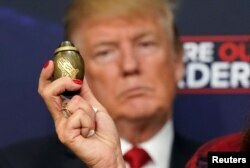 A woman holds an urn containing her son's remains as U.S. President Donald Trump holds an "Angel Families" meeting with victims of illegal immigration at the White House in Washington, June 22, 2018. "It's shameful that dems [Democrats] and the media exploited this photo of a little girl to push their agenda. She was not separated from her mom. The separation here is from the facts. Dems should join POTUS [the president] and fix our broken immigration system," Sander wrote on Twitter. Time magazine cropped the photograph of the girl and juxtaposed Trump to create a cover image of the president looking down at the 2-year-old. The accompanying article incorrectly stated the girl had been carried away from her mother, screaming. The magazine on Friday issued a correction, noting that the original version of the story misstated that the girl had been carried away by Border Patrol agents. "Her mother picked her up and the two were taken away together," the magazine said. Trump, in a tweet Friday, said: "We cannot allow our Country to be overrun by illegal immigrants as the Democrats tell their phony stories of sadness and grief, hoping it will help them in the [November] elections." All 435 seats in the House and a third of the 100-member Senate will be contested in the November election. 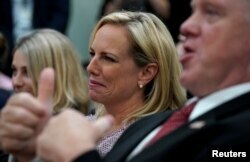 Acting Immigration and Customs Enforcement Director Thomas Homan gives a thumbs-up as he and Homeland Security Secretary Kirstjen Nielsen listen during an immigration event hosted by President Donald Trump at the White House in Washington, June 22, 2018. Majority Republicans in the House of Representative plan to hold a vote on an immigration bill next week, even though Trump urged them Friday to drop their efforts for now. Even if the House Republicans approve a bill, it faces almost certain defeat in the upper chamber, where the Republicans also hold a majority but where Democrats hold enough seats to prevent the GOP from reaching the 60 votes needed for passage. Earlier in the week, the president had called for Congress to quickly approve sweeping immigration legislation. But in a Friday tweet the president said, "Republicans should stop wasting their time on Immigration until after we elect more Senators and Congressmen/women in November. Dems are just playing games, have no intention of doing anything to solves this decades old problem. We can pass great legislation after the Red Wave!" U.S. Representative Ileana Ros-Lehtinen, a Republican representing a majority Hispanic district in Florida and who is not running for re-election, termed the president's tweets "schizoid policymaking."